So this recipe is sugar free, as in no white processed sugar, dairy free and all around vegan! I can have all the real sugars, thank god! But still very balanced. So things like honey, coconut sugar, fruit, agave etc. 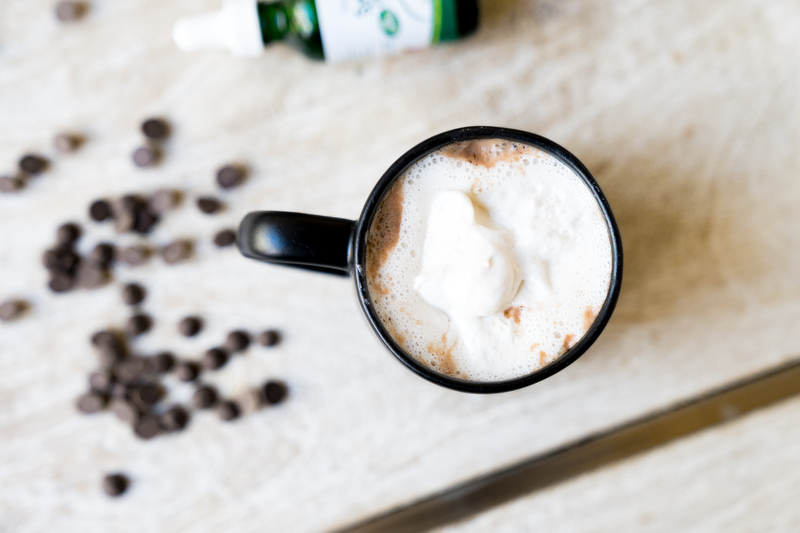 So I created this dairy free hot cocoa! It’s so delicious! I don’t even miss the processed sugar. 1 Tbsp Coco Whip For the topping (btw this is a pack of 12) you can buy this in stores at Sprouts, but I haven’t seen it anywhere else. I bet Whole Foods would have it. Add everything to a pot besides the whip and bring to medium heat. Stir, stir stir! Keep stirring around until mixed up and chocolate is melted. Once its melted, hot and mixed up, then remove and pour into a cup. Top with Coco Whip if you would like! Makes it that much better! BTW if you aren’t signed up for my newsletter, you should put in your email! Thats all you have to do, completely free content straight to your inbox! I’ll be sending them out 2x a month. Put in your email on my sidebar, or when that box pops up when you open my site. You guys will love the content I’m going to be sharing so don’t miss out! Now that I’ve hit 17 weeks, I think I’m onto back to eating normal & healthy. I quit dairy again and its helped so much with my zit problem, so I’m off the ramen train! 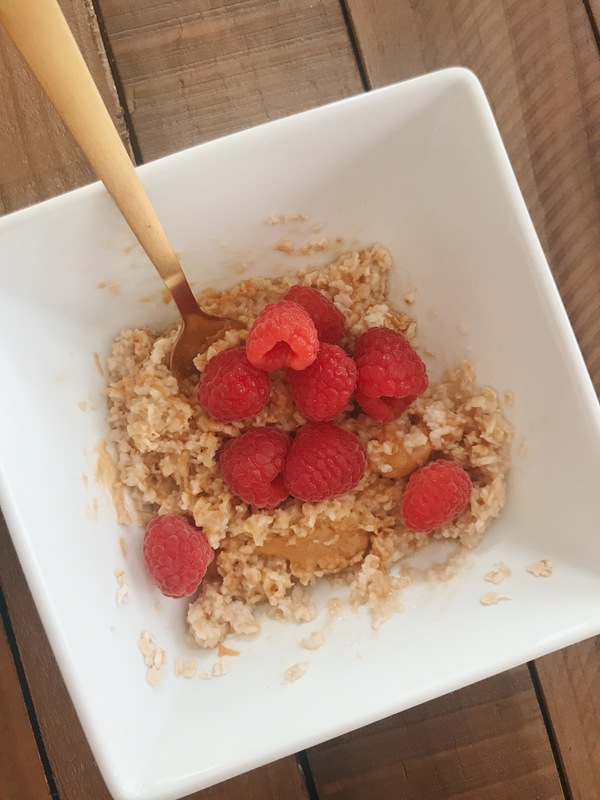 I wanted to quickly share the things I’ve been eating during pregnancy. Everyday is a little different. I eat a lot and now that I’m working out, I need EVEN MORE. 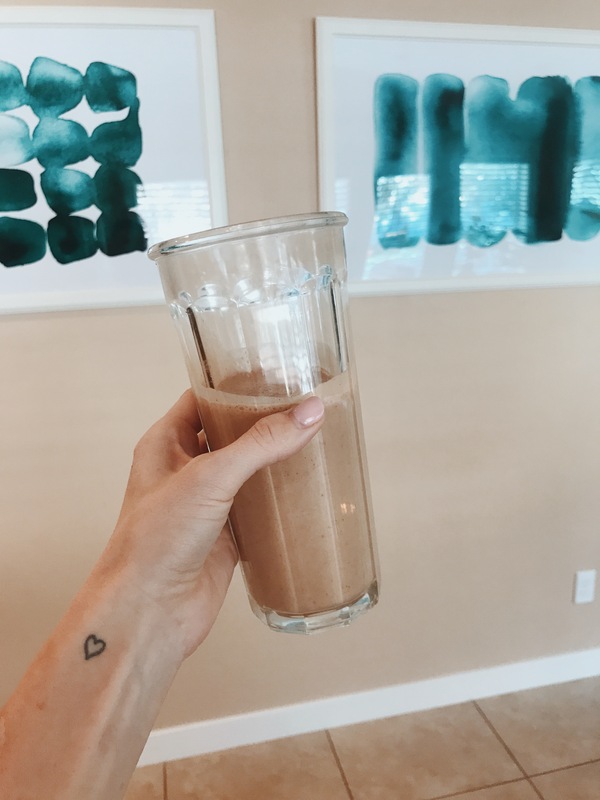 So I’m just going to walk through my day with you and give you some easy recipes to quickly throw together that are healthy for you and the baby! First things first, I have a cup of coffee and froth my almond milk, sweet leaf peppermint sweet drops, cinnamon and a little peppermint mocha creamer. Normally I just have that and I’m off to the gym, but I can’t work out on an empty stomach during pregnancy. I’ll either eat a piece of toast with grassfed butter, or 1/2 cup oatmeal with peanut butter or nuts, and raspberries. When I get home from the gym I’ll do my celery juice, I blend with the Blendtec & do 1-1/2 cup waters, 7 celery stalks and then strain it. Then I’ll eat my official breakfast. 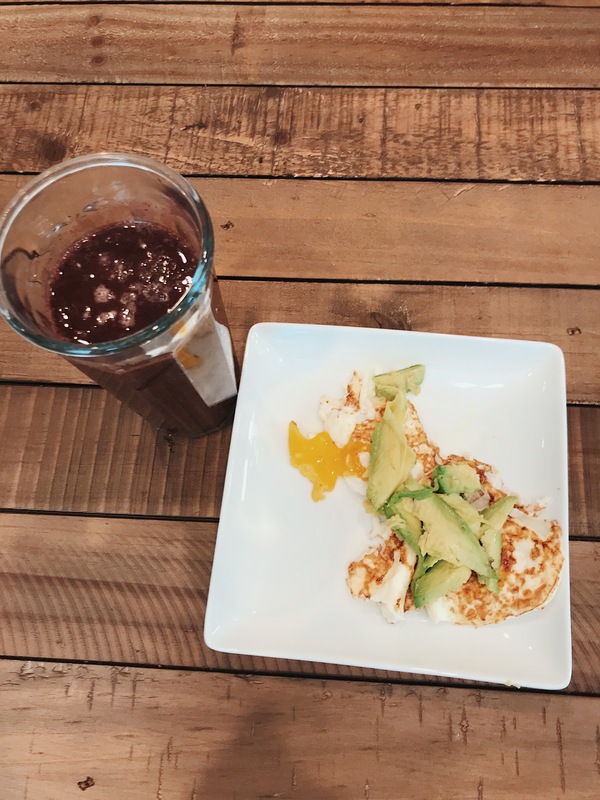 Ginger berry smoothie with 3 eggs and 2 yolks with 1/3 avocado! Blend 1 cup water, handful of spinach, sliver of ginger, 1 cup frozen berries (I get mine at costco) & thats it! Super simple. I like to keep everything I make very easy, but healthy. So after I usually wait at least 2 hours before eating the next thing, but it just really depends. Sometimes I’m onto the next thing an hour later. But in this case it was 2 hours later. I prep my quinoa every week, so I’ll do it for TJ and I for the whole week. I’ll make 2 cups with 4 cups chicken broth and cook in my Aroma Pot. That way I can throw in bowls very quickly all week long. Here is the recipe. Cook your eggs how you like. Add 1/2 cup quiona, avocado oil and pink salt to a bowl. Mix around. Then top with the eggs & avocado! Now, before this I had a few bits of nuts, but I didn’t post that. This is a shake I just love! Before this dinner I had a piece of aspen mills wheat toast with grassfed butter! Gotta always keep something in my stomach at all times! Heat up oil, and add onions. Cook until translucent on high. Add veggies and reduce heat to medium. Sautee then cover for a couple minutes, coming back to stir again. Do this until the veggies are cooked through. Add your cooked quinoa, then add soy sauce and let the quinoa heat up for a couple minutes. Mix around and dish! 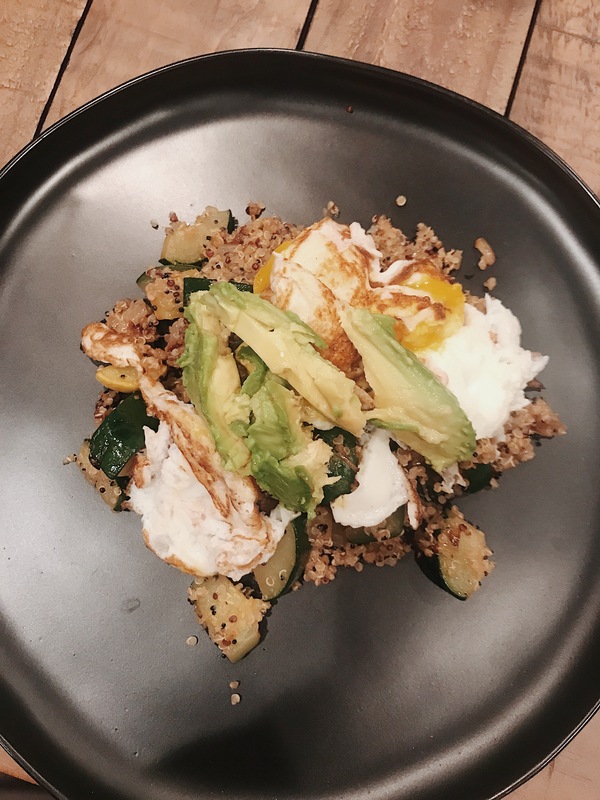 Top with your eggs and avocado! Let me know if you have any questions! 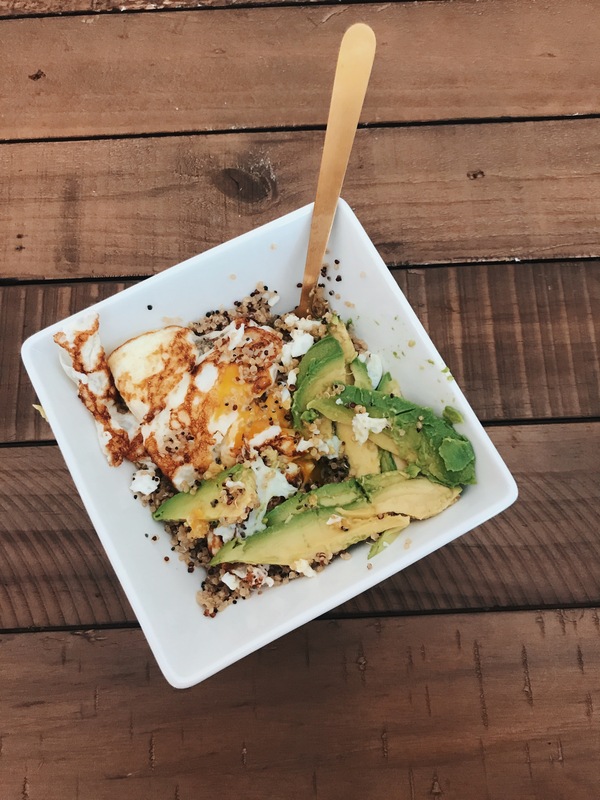 The whole purpose to share this post was to show you what kinds of things I’m eating now that I feel better and ready to eat all the good stuff. All of these recipes have killed my heartburn and acid reflux! I’m happy to report I have none! So hopefully this will give you an idea of what foods to help you with heartburn and just overall feeling better. I avoid dairy for the most part because thats what I noticed makes my acid reflux worse.